Come celebrate with us as the Judith Adele Agentis Charitable Foundation (JAACF) enters its seventh year. 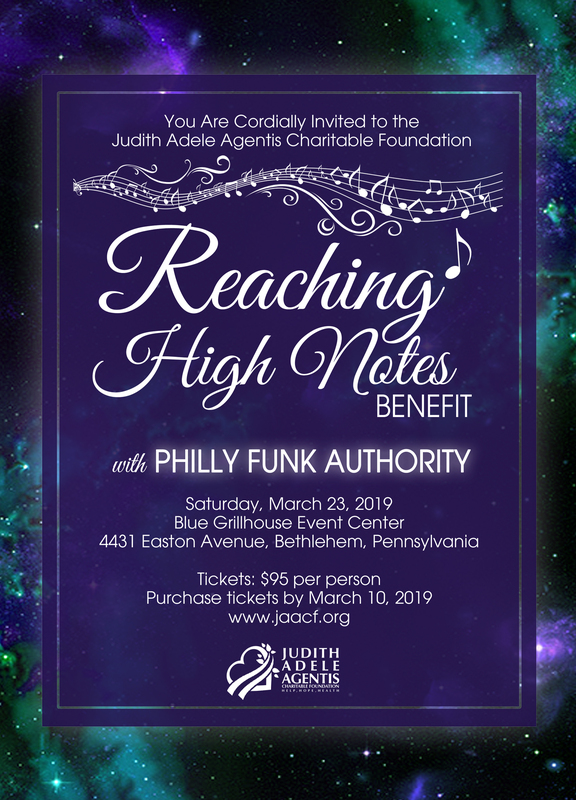 Join us Saturday, March 23rd at Blue Event Center for “Reaching High Notes,” with the Philly Funk Authority for a magnificent evening of food, music, live fine art and silent auction, and dancing. Your generous sponsorship and attendance will be greatly appreciated. Hear compelling stories of cancer survival and hope, and learn how your support works throughout the year. In the most personal moments of life to meet and support the guest and their family and friends at hospice. Since 2013, more than 16,000 meals have been delivered by JAACF to guests and individuals on vigil with a loved one in hospice thanks to the support of our participating Lehigh Valley restaurants, and supporters and donors like you. Providing an opportunity for family members to share feelings and life moments with other families in the warm and friendly environment of Judie’s Table at St. Luke’s Hospice House. The active education for the importance of early cancer detection education and awareness. Ongoing promotion to the public, your friends and family regarding their individual responsibility for cancer screening. Exclusive sponsorship levels for our upcoming fundraising dinner event, “Raising High Notes” at Blue Event Center, PA on Saturday March 23, 2019 starting at 6 PM. Please consider supporting this event by purchasing one of our dinner sponsorship packages. Logo and mention at event and event booklet. Two tickets with preferred seating. Tagged Reaching High Notes, sponsorship levels. Bookmark the permalink.